It was my first time face to face with an apex predator. Tiger shark. Light dappling on a skin that normally I would consider part of the great beauty of nature.. if it weren't adorning such a deadly adversary. He saw me and circled slowly considering his options. I could see he was hungry by that lean, cold look in the eyes of a born killer. It was him or me. I pulled out my bright yellow Spyderco raising it into position to strike when the inevitable rush came. I was scared. Scared but ready and prepared as the rust free metal gleamed from the hollow grind to the wicked edge. I was glad I had dropped it to 26 degrees inclusive. This wasn't about durability. I would only get one chance. He and I were on fate's calendar and nothing after this would be same. Then, in one of those epiphany moments.. you know.. when it all hits you at once.. some guy in a vest said something about weapons in the aquarium and they threw me out. I’ll just come out and say what everyone is thinking. SpyderEdgeForever’s threads have jumped the shark. Don’t bring a knife to a shark fight. Reach deep into the shark's mouth, and grab the inside of it's tail. That way you turn the shark inside out, and it will eat itself until there is nothing left. Sweet lord. I watched that for like a minute. I’ve always been fascinated by sharks, like more than a normal person who just watches shark week. I have in my house right now a single surviving stuffed toy from my childhood: a great white shark. My fascination, however, did not manifest like it does in others, as I have no interest in being in the vicinity of a shark in the wild. My anti-shark defense system happens to be identical to my hit by train defense system and my get consumed by lava defense system: don’t be there. Spook410, do you ghost write for Clive Cussler? 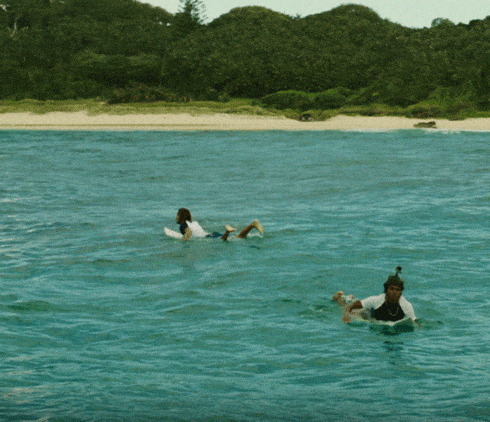 I think it's from The Shallows movie. I've heard lots of stuff that recommends wearing bright black and white patterned swimming clothes, because the shark will see you and realize that you're not a seal and you might be an orca, and orcas are scary to sharks. Can anyone tell me if this is accurate? Knives are probably not going to be much use against a shark attack, but carrying one certainly can't hurt anything. Hmm. I don't want to look like an orca in my swimsuit either. Was I the only one watching that shark clip for like a couple minutes straight. That was from a movie though, I recognized it. No like I said I stared at it for far too long. Good to know that was fake, but it’s totally within the realm of possibility. I am pretty sure that the shark will size you up and know it can't be an orca aka killer whale. ^ the clip above, is referenced from a movie called. Yea it was actually a ok movie too. A woman surfer was trapped on a rock out in the ocean on a sandbar, surrounded by deep water. And this great white shark is just keeping her there trapped circling her over and over, and eating anything, or anyone that gets in the water. Believe it or not the “Go-Pro” on that surfer on the rights helmet is what saves her, and ends the movie. What you really need is a 3000 psi tank of compressed air and a rifle. Its true, saw it in a movie. Or a pistol. Point blank to the shark and a .45 ACP will penetrate about a foot. Depending on how good your pistol is, it will also cycle reliably under water too. Glock doesn’t come to mind lol. Something hammer fired, to avoid light primer strikes. Wait, wow, was it really? Does anyone read other posts before they comment anymore? Last edited by cabfrank on Sun Oct 14, 2018 11:11 pm, edited 1 time in total. I’ve seen the damage a “bang stick” can do underwater ... much better option than a knife if you are worried about a shark attack underwater. On the surface, if the shark has decided you are lunch, I don’t think much will help other than an easier target between you and the shark.